Vegetable oils are classified in chemical-physical and organoleptic characteristics. The chemical-physical classification of olive oils is to be found in the EC Regulation n. 1513/01 dated 23-7-01, L201 (see ONAOO table). 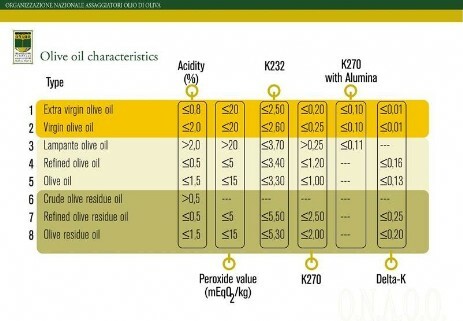 The second issue of the United States Standards for Grades of Olive Oil published by USDA in the FEDERAL REGISTER on April 28, 2010 (75 FR 22363) accepts the EC grades and adds some quality criteria in the oil purity area. (2) Muddy-sediment. A flavor defect caused by storage of olive oil in contact with the sediment for long periods giving the oil a putrid flavor and odor. (3) Musty. A flavor defect occurring when low temperatures and high humidity promote mold growth. The resulting oil has a mushroom-like odor.
" 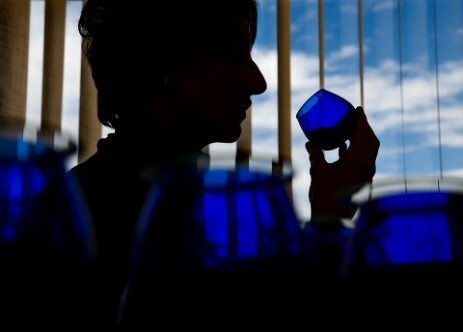 Professor I think I understood : the Good Olive Oil tastes like alive olives, the bad one like dead olives ". The Protected Geographical Indication (PGI) is the mark of quality that is given to agricultural products or foodstuffs where only one phase of the production process has a link with the geographical area.